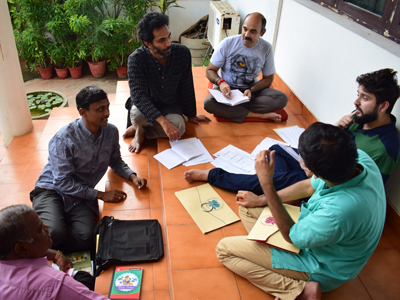 SAFIC conducted its annual Sanskrit for Beginners course, titled ‘Spandana: Feeling the Pulsation of a Divine Language’ from January 20 to26, 2019. 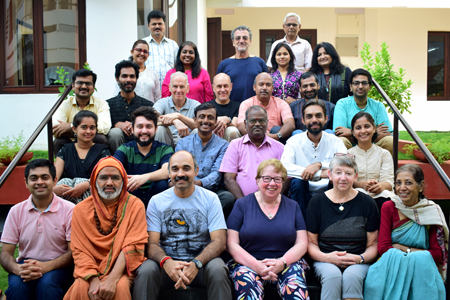 A group of 18 individuals, from different parts of the country and some from abroad, young and old, diverse and alike participated for this week-long intensive course conducted at Society House. 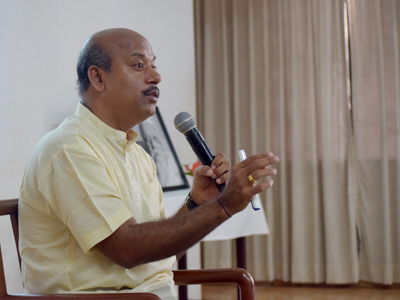 The course was facilitated by SAFIC Director, Dr. Sampadananda Mishra. Every morning, the workshop began with one hour of Mantra Yoga session. Two sets of mantras were selected for these sessions: a small number of Vedic–Upanishadic mantras and some devotional mantras and prayers. Every day, the participants were taught a few mantras alternating from both the sets. In addition, chakra purification mantras and beej mantras were also practiced in one of the sessions. A few additional people who were not a part of the workshop, including some foreign visitors, also joined the mantra yoga sessions with the permission of the course facilitator. For each of the mantra, Dr. Mishra first explained the meaning of each line, going word by word and also explaining how each word was formed, often going to its root-sound and its deeper meaning. Then he would chant the whole mantra once in its proper chandas and rhythm. This was followed by him reciting each line slowly and the group reciting the same line after him. This practice recitation in parts went on for two or three times as necessary, and finally the group would be ready to chant the whole mantra with the Guru. As the sacred sound of OM resonated with the chanting of the mantras, the whole vibration of the classroom would become deeply uplifting and relaxing. The final mantra yoga session of the workshop ended with the chanting of all the mantras learned and practiced during the week. The next two sessions were dedicated to the Sanskrit alphabet (varṇamālā) which introduced the learners to the logic, science and philosophy behind the letters of the language. One special session titled ‘System of Root Sounds in the Sanskrit Language’ focused on the deeper meaning behind the usage of words and the concept of root-sounds and seed-sounds where in each sound carries within itself a particular meaning and a force. 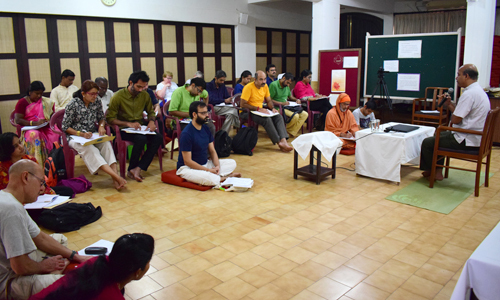 Two sessions on Sanskrit grammar (vyākaraṇam) gave an insight into some of the basics which would help a beginner while reading and writing Sanskrit. The specific topics covered in these grammar sessions included the seven cases (vibhaktis) in which a Sanskrit noun is declined, and an introduction to visarga sandhi. A part of the workshop focused on helping the learners develop a sense of ease and confidence in conversational Sanskrit. Every day, two sessions were dedicated towards speaking in Sanskrit (sambhāṣaṇam) where a certain group of words, pertaining to verbal forms, time, numbers, everyday items, etc., were introduced to the participants who then attempted to form and speak simple sentences in Sanskrit. 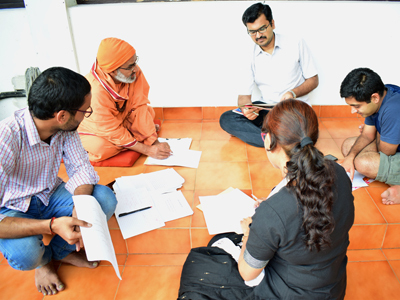 Several group activities, such as small-group discussions, singing of nursery rhymes, and writing simple stories in Sanskrit helped boost the confidence levels of the participants in speaking Sanskrit. 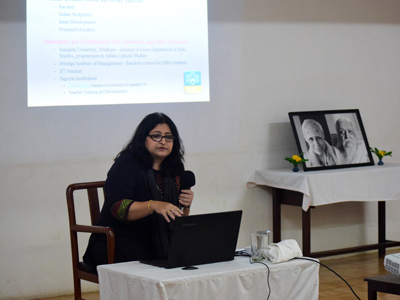 A session on Sanskrit resources available on the Internet showcased the range of online materials available which interested learners can use for their continued learning. The participants were also introduced to the SAFIC project on Srimad Bhagavada Gita and how the website and app that resulted from this project can be utilized for not only studying this scripture but also learning Sanskrit. A small presentation giving an overview of various other projects and works undertaken by SAFIC was also arranged. The workshop concluded on a very positive note. Each of the participants briefly spoke about their overall experience of the workshop, the sessions which were most helpful for them, and how they hoped to continue with their Sanskrit learning journey beyond the workshop. The workshop ended with distribution of certificates and sweets.